DI is one of the significant topics in the Quantitative Aptitude Section for SBI PO exam. In SBI PO examination a large number of problems are asked on DI. The expert team of jagranjosh.com has come up with Practice questions of DI for SBI PO prelims exam 2016. Data Interpretation (DI) is one of the significant topics in the Quantitative Aptitude Section for SBI PO exam. In SBI PO examination a large number of problems are asked on DI. It is noticed that problems asked in first slot of SBI PO prelims examination 2016 held on 2nd and 3rd July are not very difficult but they are time consuming if individual is not aware of the short tricks. Candidates can attain expertise in this type of questions through adequate practice. The expert team of jagranjosh.com has come up with Practice questions of DI with Answers for the next slot of SBI PO prelims exam 2016 that is scheduled to be held on 9th and 10th July. Directions (1-5): Study the following Table and answer the questions given below. 1. What is the respective ratio between the Ticket sell in cinema P to cinema T in the year 2015? 2. What is total number of Ticket sell in cinema R in all the years together? 3. Which cinema sells maximum number of ticket in all the years together? 4. What is the difference between the numbers of ticket sold in cinema Q in 2011 and in cinema S in the year 2013 (in thousands)? 5. By how much percentage the number of tickets sold in T increased/decreased in 2015 as compared to 2010? 6. What is the ratio of the number of Marketing students in Institute A to the number of Finance students in Institute D? 7. 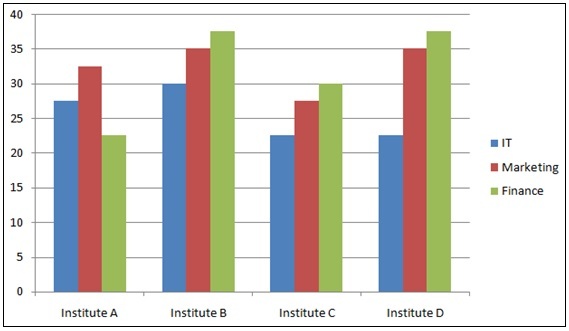 What is the average number of students in each faculty of Institute D? 8. What is the average number of IT students in all the Institutes? 9. What percentage of the total students of Institute C are its IT students? 10. What is the difference between the total number of IT and Finance students in all the colleges? 11. What percentage of Indian IT Professionals work either in Australia or New Zealand? 12. 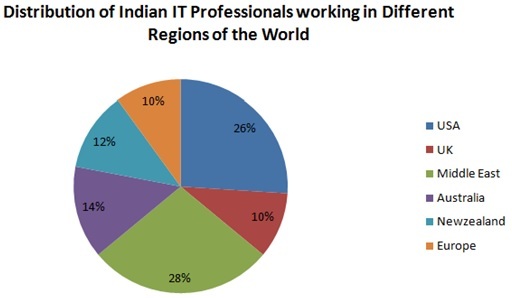 What is the ratio of Indian IT Professionals working in Middle East to Australia? 13. If the total population of Indian IT Professionals in places other than USA and UK is 19200, then what is the number of Indian IT Professionals working there? Explanation: Population of Indian IT Professionals in USA and UK is 36%. So rest of the population is 64% that is 19200. 14. If the Indian IT Professionals working in Europe is to double the next year and the remaining is constant, then what is the percentage of Indian IT Professionals working in Europe to the total Indian IT Professionals population working abroad next year? Explanation: Percentage of Indian IT Professionals working in Europe currently is 10%. 15. If the Indian IT Professionals working in USA and UK triples in the next year, what would be the ratio of their population? Directions (16-20): Study the following pie-chart and table to answer the questions. 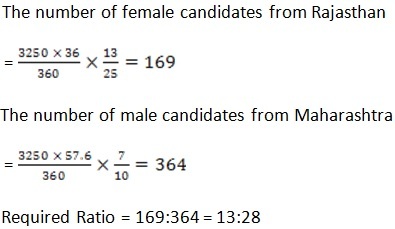 Degree-wise breakup of candidates for the Bank PO interview coming from different states and the ratio of male to female (Total number of candidates = 3250). 16. How many male candidates are appearing for the interview from Uttar Pradesh? 17. 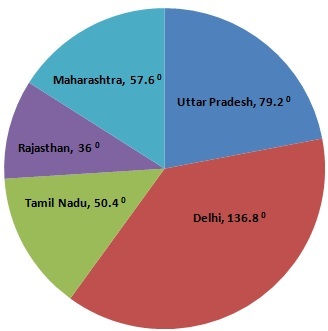 What is the respective ratio of the number of female candidates from Rajasthan and the number of male candidates from Maharashtra? 18. The number of male candidates from Delhi forms what percent of the total number of candidates appearing in the interview from Delhi? 19. The number of female candidates from Maharashtra forms what percent of the total number of candidates appearing in the interview? 20. What is the total number of male candidates appearing for the interview?